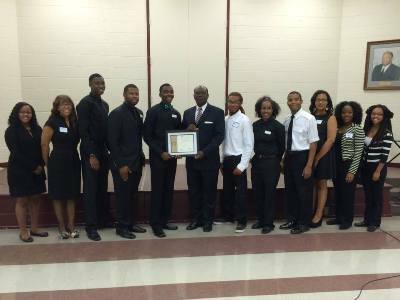 This past month, Madison Rotarians helped establish Alabama’s first university-sponsored Rotaract Club at Alabama A&M University. The organization was chartered as “the Alabama A&M University – Global Social Service Research Rotaract Club.” Its mission statement states the club will provide “a high standard of leadership, promote excellence in academia and a moral compass devoted to service, to its members, the A&M campus and global communities.” Membership is open to any A&M student. Club officers for the current year are president Eric Moss Jr., vice president Tyler K. Pearson, secretary Justin Hobdy and treasurer Brianna Kenney. Other members are Juwan Allen, Quintarius Fails, Jamila Fletcher, Nikki Howard, Sandra Lyinga Karumbreria, Jaruis McGhee, Antoinette Roberts, Andrew Stephens, Jerald Thomas, Randal Tigner and Justin Wright. Rotarian Karen Morris, the New Generations Service Director, noted that we look forward to working, mentoring and supporting this wonderful group of young adults. Along with Morris, Madison Rotarians who worked with A&M contacts to found the club are Paula Cushman, Shelia Nash-Stevenson, Janice Schuckman and Sandy Patel.